What to do if you come up against the Rebel and the Charmer. 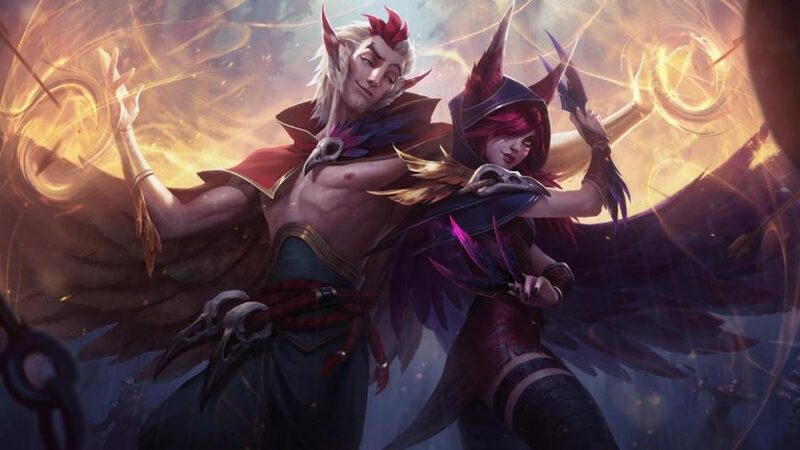 Xayah and Rakan have proved extremely popular in solo queue and they have already seen success in the pro scene. Many pro players have praised the two champions’ kits, with many going on to use their unique play styles to give them an edge in the LCS. Understanding how to counter Xayah and Rakan will help increase your chances of winning more games at City Champs, where you can represent your city in live matches against rivals from around the country. So how do you deal with the Rebel and the Charmer? Xayah is easy to counter once you realise that her kit lacks any form of mobility or escape. Her aggressive play style forces the feathery fiend to lean heavily on Bladecaller for self-peel, and any champ that can avoid the stun will find it fairly easy to stick to her. Some ADCs can charge straight into combat and start bursting enemies down with a barrage of auto attacks, but Xayah requires time to set up her feathers before she can unleash the bulk of her damage. The aim of the game is to quickly burst her down before she has a chance to put too many feathers out, so it’s important that you pick someone like Caitlyn or Ashe who can outrange and avoid most of her deadly plumage. The Rebel greatly benefits from prolonged skirmishes as shorter trades often leave her without the ability to stun her opponent. To win these trades simply poke her whenever she comes into range and ensure you keep your distance from her cone of feathers. Even if Xayah tries to retaliate, she automatically pushes the lane due to the AoE damage from her feathers, so try to coordinate with your jungler and set up ganks. This tactic will usually net you and your jungler a few kills, as Xayah is ridiculously vulnerable when pushed due to her poor mobility. The Rebel’s damage is also easy to avoid, as her feathers are clearly visible and quickly lose agency when you learn to stay away from them. Xayah’s kit is tailored towards kiting backwards, as she benefits from drawing her enemies into her zone of feathers. It’s important to take this into account when retreating from Xayah, as she loses a lot of power when chasing kills due to Bladecaller requiring a lengthy setup time. Any champion that is remotely aggressive can simply bypass her damage and go in for an easy kill, but if she can set up her feathers you could be in for a rough time. Remember to avoid choke points as most Xayah players will strategically place their feathers in areas of high enemy movements. If Xayah can establish a zone of control during teamfights, you could quickly find yourselves in fatal feathery storm. Lastly, it’s important to understand that Xayah’s ultimate has a brief invulnerability frame, where she becomes untargetable for 1.5 seconds. Featherstorm can be utterly devastating if you and your team are not careful, so simply wait for her invulnerability to pass before you start using your ultimate and combos to shut her down. Overall, if your team opts for a reactionary playstyle and picks champs that can punish her lack of mobility, you will be able to quickly counter the Rift’s Rebel. Rakan is a strong all in laner who uses his high mobility to lockdown his foes with tanky CC engages, while providing decent peel for his carry. However, the Charmer lacks the innate tankiness of supports like Leona and Braum, and can be easily punished if he makes a mistake. Rakan doesn’t have any forms of damage to match aggressive plays, so take advantage of this by pushing out your lane as quickly possible. Once the lane is pushed most Rakan players will feel pressured to engage, which usually results in misplays and poor trades. Make sure you ward your lane to ensure you have eyes on the enemy jungler, as aggressive lane bullying can often land you in a lot of trouble. The Charmer certainly has a lot of mobility and this alone can be rather daunting to play against, especially if you’re playing an ADC who lacks any form of escape. However, Rakan is best suited as a secondary engage for his team because he lacks the tankiness to actually survive most teamfights. You can avoid his combo by ensuring you don’t group closely together with your teammates, this will often leave Rakan with very few options when he’s trying to use his ultimate. Rakan may be a tank but he’s incredibly easy to burst down, so don’t be afraid to focus him before he can use his abilities. Countering Rakan is also ridiculously easy if you have any forms of CC that can disrupt his mobility, especially if you can use stuns and knock-ups in coordination with your carries. Once Rakan reaches levels six he will be looking to engage your squishy damage dealers with his ultimate, which grants him a 50% movement speed buff, and deals magic damage to enemies he contacts for the first time, in addition to charming them. Most Rakan plays will use his ultimate before they dash into your backline with Grand Entrance, as this allows him to instantly disrupt your carries with his CC. If you happen to see the Charmer roaming around the Rift at City Champs, make sure you remember this combo, as it could be the difference between winning and losing a game. How does City Champs work? Once you purchase a City Champs ticket, you will be placed in one of four tiers based on your solo queue ranking. However, you must play six qualifying matches in order to have a chance at representing your city. If you lose the majority of these matches, you'll play Challenge Matches as a reinforcement to earn points that help support your city. If you manage to make it to the big leagues, you'll be playing live with local players in a battle for regional pride. If you wish to secure ultimate glory for your city make sure you sign up for City Champs today. Sign up for the Atari Speakerhat beta test for a chance to win an exclusive Atari prize pack. Make sure you're fully ready before you hit Summoner's Rift.